"Locksmith's Sign, 'The Dog,' " from 19th-century France. Hard as it may be to believe, the Barnes Foundation has even more wrought iron on its walls than it does Renoirs. The permanent galleries hold some 887 hinges, keyhole escutcheons, farm implements, pieces of Conestoga wagons, and other mostly functional objects. They are a large part of what gives the place its character, its weirdness. Since its galleries were transplanted to the Parkway in 2012, the Barnes has done a series of special exhibitions intended to cast a light on what Albert Barnes collected and the way he showed the collection. The latest, "Strength and Splendor: Wrought Iron from the Musée Le Secq des Tournelles, Rouen," features objects more refined and complex than most of the iron he collected. And while Barnes cast metalwork in a supporting role in the galleries, here the iron takes center stage, and justifiably so. These locks, tools, shop signs, door knockers - there's even a corset and a very menacing iron hand - fuse the skill of the blacksmith with the sensibility of the jeweler. That's not always a good thing, however. Wrought iron gets its charisma from being created in the heat of the moment. It is magic to be able to tease molten metal into the shape of the delicate flower, and my favorite works of wrought iron, like those of Philadelphia's early 20th-century master, Samuel Yellin, subtly express the fire and violence of their making. Most of the roughly 150 pieces in this show, from a collection of more than 6,000 objects, were made for the noble and wealthy. They were engraved, chiseled, gilded, and otherwise decorated after coming off the anvil. One key takes the form of a lantern, complete with a stained-glass window. The lock mechanisms do not merely work, they tell a story. Providing security has always been one of the most important uses of cast iron. A beautifully ornamented gate or grate is an offering to passers-by, but its main purpose is to keep them out and your goods safely inside. The earliest work in the show is a 1,200-year-old bronze key made by Vikings, who presumably were attuned to the problem of keeping out unwanted intruders. There is a thief-catcher device that could trap a would-be lock-picker, or at least break his arm. There are chests and caskets for valuables, including the amazing 18th-century Nuremberg chest, equipped with a false lock and decorated with sinuous wrought iron plant stems. When opened, the entire underside of its lid is a locking mechanism that was clearly designed to be seen and admired, if only by a few. These are items of extreme luxury intended to protect other luxury goods. Their decoration is proof of their maker's virtuosity and their owner's wealth. But there was a psychological, or even a moral function to the decoration. By encrusting the locks and treasure chests with symbols of power and legitimacy, they were perhaps made to signal that the wealth is legitimate and deserved. When you incise a lock with a biblical story, you ennoble it, and perhaps add yet another layer of protection. One of the most delightful, if uncharacteristic works in the show is a sign made for a locksmith in 19th-century France. 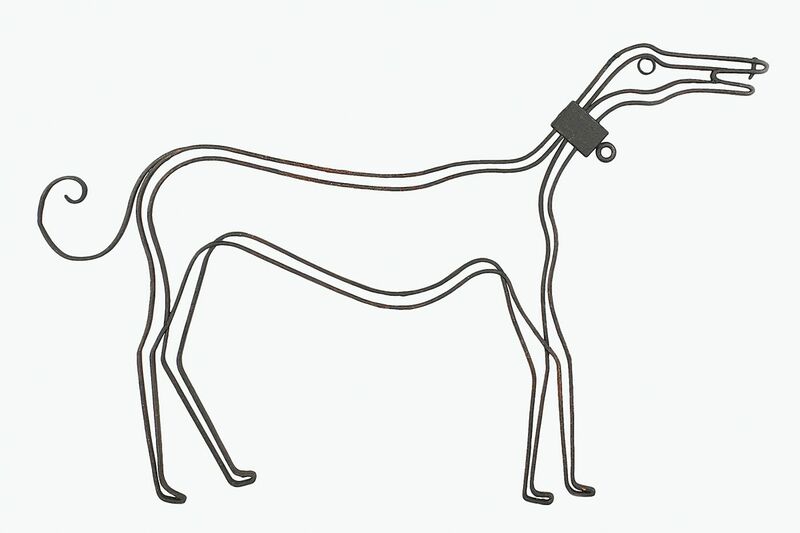 It is a dog, possibly a greyhound, drawn freely in what appears to be a continuous rod of iron, somewhat like Alexander Calder's wire sculptures. His collar is a lock. Both the dog and the lock are protectors, on the watch against burglars. The central section full of French shop signs is the most engaging part of the show, which isn't surprising because they were intended to communicate their message at a distance, without words. Similarly, door knockers were intended to both impress and welcome visitors. One showing the unlikely battle of a lion and a salamander turns out to be a complicated political statement. There must be a story behind the 16th-century Swiss example with a winged young man wearing a jaunty feathered hat. If I were standing at the door, I would assume someone interesting lived inside. Except for a few cooking vessels and a hinge or two, there is almost no overlap between the metalwork in this show and what Barnes collected - mostly American items, many from Pennsylvania, and mostly useful, made for ordinary people. As with everything, Barnes had strong opinions. "The greatest artists of all time," he wrote, "have not only been the composers, painters and sculptors, but workers in the so-called useful arts like wrought iron, pewter, glass, pottery, etc." A sentence later, he noted offhandedly that "creation stopped in America about 1830." Barnes began to collect ironwork after he had already amassed nearly all the paintings for which his collection is known, and clearly he sought pieces that would look good hanging on the wall with his art. This brought a bias toward the two dimensional, and disregard for the item's function. Often, the iron pieces hang in such a way that it is impossible to figure out what they are. Their graphic profile is all that matters. For this exhibition, the Barnes commissioned a work, Metal Painting by Ellen Harvey, which is a great educational tool. She has painted the outlines of all 887 pieces of metalwork in the galleries - at actual size - onto blocks of wood to which magnets have been attached. Unlike the works on the Barnes walls, they can be moved around on the metal panel to which they adhere, but they are shown like a huge, somewhat enigmatic jigsaw puzzle. The number and variety of the pieces is impressive, though the painting itself does not celebrate or emulate the craftsmanship of the objects themselves. In an excellent essay in the catalog, Richard J. Wattenmaker, a curator who once taught at the Barnes Foundation, shows how Barnes placed ironworks on the walls that echoed forms and compositional elements in the paintings. He quotes letters in which Barnes wrote, for example, of how he placed a pair of hinges from the house in York, Pa., next to Cezanne's Large Bathers, because the profile of the hinge is similar to the pose of one of the bathers. In short, he was saying, if you look closely at the ironwork, you will see the formal qualities Barnes believes we should be seeing in the paintings. If you want to look at art the Barnes way, all those iron hinges, calipers, and keyholes are the key. Through Jan. 4 at the Barnes Foundation, 20th Street and the Benjamin Franklin Parkway. Hours: 10 a.m. to 5 p.m. Wednesday through Monday. Tickets: $22–$25; 65 and over, $20–$23; students and 6 to 18, $10; 5 and under, free.